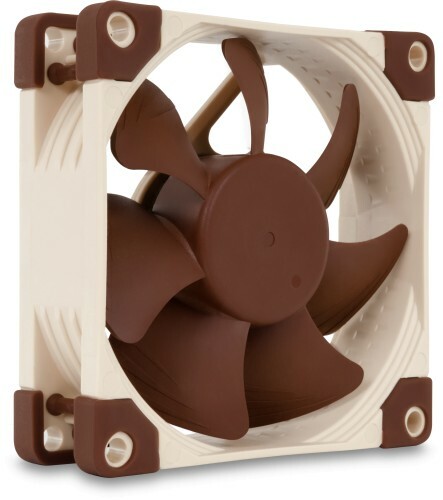 Noctua's new 80mm fans have been updated to feature their innovative technology. The NF-A8 ULN is their quietest 80mm fan, especially when used with the U.L.N.A., only 6.5dB(A). The NF-A8 is a highly optimised, premium quality quiet 80mm fan. Featuring Noctua's AAO (Advanced Acoustic Optimisation) frame as well as sophisticated aerodynamic design measures such as Flow Acceleration Channels, the NF-A8 further improves the renowned quiet cooling performance of the award-winning NF-R8. The ULN version provides super-slow 1400/1100rpm speed settings for ultra-low-noise applications and highly noise-sensitive users who demand near silent operation. Its superb running smoothness, reference-class SSO2 bearing and Noctua's trusted premium quality make it an elite choice for the highest demands. WOW. It’s nice to treat yourself sometimes and purchase a little luxury that just oozes quality. Even the packaging is wonderful. A door on the front is secured with Velcro and allows you to view the contents and information easily. Getting inside is a pleasant surprise too. No welded plastic cartons here. The inner pack slides out of the card case, and the plastic cover just lifts off. The rubber anti-vibration mounts each have their own little pocket, as do the accessory cable. Each cable is also labelled and the wires are secreted away inside a black over-braid secured with matte-black heat shrink. It’s a shame to hide them in a case. All in all, it makes you feel like you've made a very special purchase. It's not often you get a warm fuzzy feeling just from some packaging! But it's not just about quality packaging, it's the performance that really shines. Well, my previous case ran 3x 80mm *non-Noctua* fans: rear case extraction, CPU, and PSU. Each fan ran 19.6CFM at 15dB, and typical system temps were about 40degC. With the help of a new NoFen CS-30 case, I'm now running only 2x of these new Noctua ULN fans, one in the PSU running 15CFM & 6.5dB @ 1,100rpm (ULNA installed), and another on the CPU, but it tends to be run by the BIOS at just 700rpm, so presumably less than 15CFM and 6.5dB. The result... system temps around 37degC and so little noise that the loudest thing is the faint electrical whine from my monitor and speakers! For reference my CPU has a TDP of 65W and still runs the OEM heat sink. With this basic setup, there might not be any point (for me at least) going totally fanless on the CPU and PSU as the loudest thing now is the electronic circuits themselves. All in all, these fans are just wonderful.